Instagram is by far my most favourite social media platform: engaging images, 24hr stories, the space to write you own stories, and the community vibe around the platform. With the predictions for 2017 social focussing more and more on photo and video content, it's no wonder that Instagram has focussed the platform to not only be attractive to individuals but also to businesses and brands. 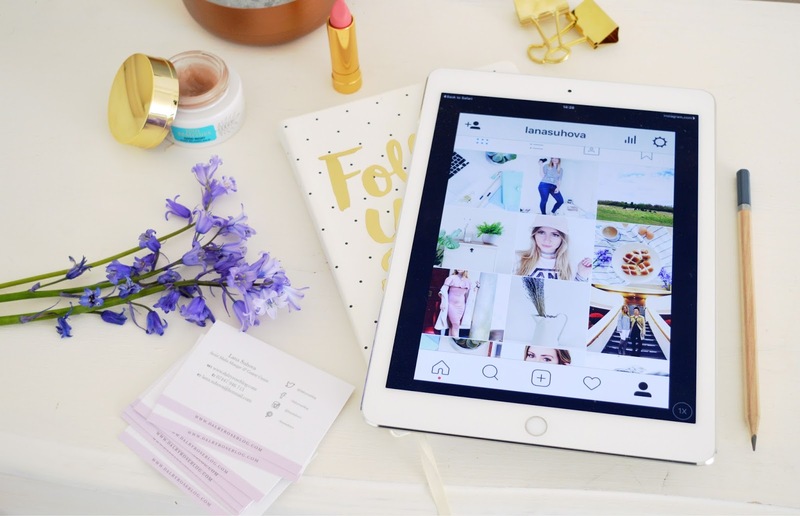 When the platform first came out, a lot of companies didn't see much point of them being on Instagram - now I'm here to tell you that you absolutely must have a presence on Instagram! As a freelancer, 50% of my work comes in from companies contacting me via Instagram DM and talking about projects. I use the platform to showcase some of my work, engage with my local community, find inspiration, and network - all things which are valuable to any business. But Instagram isn't as easy as posting a photo and checking back in a week to see how it's done - it's amazing to see that when I spend an hour networking on Instagam I can walk away with 20-30 new followers, and potential work opportunities. But if I ignore my community and leave Instagram for a weekend, I wake up on a Monday morning to lost followers and no engagement. And you have to expect that if you don't put anything out on the platform - you won't get anything back. 1. Write an interesting bio - use the space to tell people a little bit about yourself, what you do, how you can help them, and remember to include your website! Also, make sure your profile is set to public - otherwise users won't see your photos and are not very likely to follow, and the ones that do decide to give you a follow will have to be manually accepted. 2. Develop a theme and niche - especially as a business. There are so many themes you can decide to focus on - travel, cooking, fashion, beauty, tree surgery, coaching, inspirational, illustration, photography, DIY, blogger... The list is truly endless! But it will help your followers to understand what you are and what you do if it's clear on your profile that you're a photographer, or a restaurant owner. Try and stick to a visual theme too - whether it's light and bright, colourful, black and white; this will help your profile visually stand out and your photos to become recognisable. 3. Take good photos and use editing apps to make them even better! Sounds simple but we see so many photos on Instagram from accounts which have huge potential - but because they're photos are drab and uninspiring, we unfollow or click off their accounts. Instagram is a photo focused platform! I'm not saying you need to post a professional photo every time - smart phone cameras are excellent these days so get to know yours and use it well. Or if you do have a professional camera, mix things up and use the camera to take photos - I have a mixture of phone and camera photos on my account. When you've taken the photo, use editing apps to brighten, bring out colours, blur or sharpen part of the image - keep your eye out for a post on my favourite photo editing apps! 4. Use the hashtags. Please, use the hashtags on Instagram. If a tree falls in the middle of the forest and there was no one who heard or saw it, did it ever really fall? Well think of this when you're not hashtagging your photos on a new or developing account - not many people are going to see them. Instagram allows for up to 30 hashtags per post so utilise them - think of what you're posting about, your niche, your audience, location, and popular Instagram hashtags which will help get you noticed. You can also come up with your own hashtag for an event or cause and get your audience to participate! 5. Tag your location, and tag people/brands you are with - when someone searches that location tag, your photos will come up. This is so valuable for local businesses because now people are searching for area specific shops/restaurants/cafes! 6. Engage with your audience - find accounts you like and follow them, comment on their photos, like their photos and be social. When you're posting a caption on your own photo, ask your audience questions to encourage them to interact with you. With these 6 steps you will start to see your Instagram account grow - but remember, overnight success is like fairy dust: very hard to find. Social media takes time, commitment and knowledge - but once you've got it you will reap the rewards. Keep at it, keep improving your content and growing your community - and you will hit the targets you set for yourself. And if you're a business in Hampshire/Wiltshire, then you can always get in touch with me for social media training or management - for full list of services click here. What are your top tips for mastering Instagram? Have you tried something that got you excellent results? Comment below! I definitely agree with you that a lack of engagement just means a lack of followers and I've taken the time to try and engage more on Instagram now. It's my favourite and I wish I could just master the theme thing! I definitely am going to take the advice of engaging more and I think I need to take a look at my bio again! I just changed it but I need to perfect it! Lovely post, thanks for sharing your tips! These are really helpful tips. I really need to up my hashtag game. I find it hard to keep to a theme/niche though. I would love a theme but I don't have the time to get photos so I use whatever is on my phone. I do need to start engaging more. I think setting a certain time of the day for it might help.